An irresistible silver coloured chain link charm necklace with a polished finish and featuring a large feather charm. Feathers appear when angels are near. 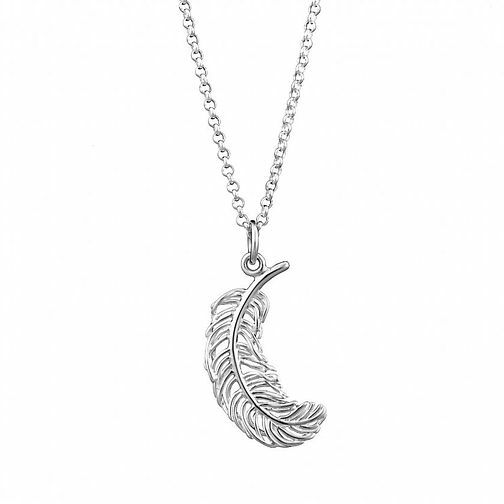 Lily Charmed Silver Feather Pendant is rated 4.8 out of 5 by 6. Rated 5 out of 5 by Anonymous from A beautiful piece of jewellery I was very impressed with this product. It was a present for a friend, which she loved. The quality was great, the design was great and the price was worth it as well. A very happy customer! Rated 5 out of 5 by Anonymous from So pretty I have bought this for a relative and was really pleased with it, the size is ideal and the sentiment is lovely.